"I am very pleased to say that Adrian Zorzi Homes sets an extremely high standard of construction and finish," he said. "Building a home is always a stressful and somewhat daunting experience, but Adrian Zorzi homes provided a level of confidence and reassurance at all times." 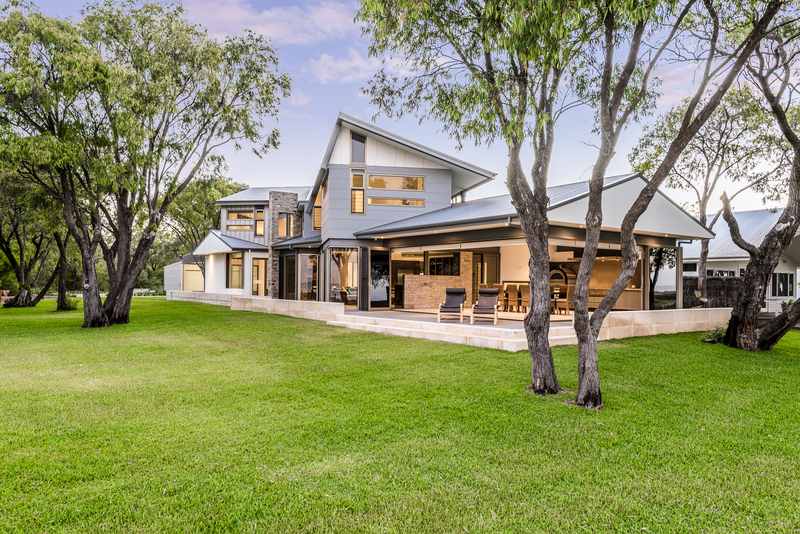 The existing home was 10 years old and had previously won an award for South West Builder of the Year, but it was beginning to date and wasn't providing the space Rod and Rhonda wished for. They wanted to renovate the home to more modern standard, as well as adding space to the floorplan. The $1.5m renovation included an extensive demolition component, extension of the living, alfresco and kitchen areas on the ground floor and the addition of four bedrooms, two bathrooms, kitchenette and balcony to the top floor. Rod and Rhonda had engaged their own architect to complete the design, and then put the project out to tender. "The design was extremely complex in its structural requirements, architectural design and in the materials to be used," Rod said." Rod said this breakdown of costs ensured he and Rhonda felt happy that they could move forward with Adrian Zorzi and that they would get the best outcome, materials and contractors on the project. "We wanted to make minor changes, which would reduce the contract sum," Rod said. "Adrian and Luke worked with our architect during the tender stage and after with the one goal — which was to get the best outcome for us." The demolition phase was extensive and included structural steel, footings and the floor system. "The supervision of the structural steel and framing was a crucial element in the construction of the home and it was completed to an extremely high standard," Rod said. During construction Adrian and Luke shared some ideas for the home that Rod and Rhonda loved. "They suggested additional stonework to the walls and fireplace, recessed skirtings to the upstairs, and the addition of linear shower grates to the bathrooms," Rhonda said. "We also took them up on the idea of an additional deck to the front sliding doors and changes to the roof lighting, which all resulted in a better overall finish and ambience to the major living areas." "The changes suggested by Adrian to the documentation were always sensible and made to improve the project — they were never made as an easy option to fix a problem," Rod said. Adrian Zorzi was on board for even the final touches, completing the installation of the limestone walls to the garden area and an extensive drive and parking area. Rod said both Adrian and every contactor and sub-contractor he brought on site provided a high standard of finish at all times. "The level of supervision completed by the on-site staff ensured that our home was built to the standards set by Adrian Zorzi himself," Rod said. "If anything was not completed to Adrian's requirements and standards, it was very simply re- done with no questions." Being a registered builder in framed construction for more than 30 years, Rod wished to use some of his trades for the mechanical services, cabinetry and stone benchtops. "Adrian and Luke had no issues using my nominated contractors for these areas and his trades and staff worked with them to ensure a good outcome for all," he said. When it came time to move in and some minor issues arose, Rod said the Adrian Zorzi team was happy to fix them. "Both Luke and Adrian have had nothing more than a positive attitude to ensure that these issues were resolved," he said. Rod and Rhonda said their relationship with Adrian Zorzi was a positive experience. "We have a holiday home built to an extremely high standard which is a pleasure to live in," Rhonda said. "We would recommend Adrian and his team to any other person who wishes to build."